The Leadership in Energy and Environmental Design (LEED) for Neighborhood Development (LEED-ND) rating system is a voluntary program that provides substantial guidance for developers who wish to develop projects in smart locations that are designed to create connected neighborhoods constituted by green buildings and infrastructure. The LEED-ND rating system, jointly developed by the U.S. Green Building Council (USGBC), Congress for the New Urbanism (CNU), and the Natural Resources Defense Council (NRDC) expands the definition of “green building” to include projects at a district scale, with greater consideration for project location. As a national standard for green neighborhood planning and design, the LEED-ND rating system emphasizes site selection, design, and construction elements to bring buildings and infrastructure together and relate the neighborhood to its local and regional context. The LEED-ND rating system is divided into three credit categories: Smart Location and Linkage (SLL), Neighborhood Pattern and Design (NPD), and Green Infrastructure and Buildings (GIB). The SLL category emphasizes project location on connected and previously developed sites with existing infrastructure, near transit, and away from important natural resources. NPD recognizes compact, walkable, vibrant, mixed-use neighborhoods with good connections to nearby communities. Finally, GIB recognizes building and infrastructure performance that reduces energy and water use, encourages historic preservation, and minimizes waste. A critical next step to implementing LEED-ND is to provide handy tools to the approximately 40,000 local governments in the United States with land use authority. These local governments determine and regulate where private development goes and how it is constructed. They adopt land use plans and zoning ordinances that determine human settlement patterns, which, in turn, dictate consequential matters such as dependency on automobiles for almost all day-to-day transportation needs (i.e., vehicle miles traveled), fossil fuel burned, carbon emissions, energy consumed by buildings, impervious coverage, flooding and stormwater runoff, potable water consumption, surface water pollution, ground water supplies, and whether our neighborhoods are livable. Those handy tools are now available. In collaboration with USGBC, the Pace University Land Use Law Center has authored the Technical Guidance Manual for Sustainable Neighborhoods and a Neighborhood Development Floating Zone. These two resources, produced as a result of funding from the Oram Foundation’s Fund for the Environment and Urban Life, with additional support from NRDC, will help local governments leverage the LEED-ND rating system as a sustainability tool. The manual assists communities and their professionals by guiding them through the process of using LEED-ND to audit local plans, codes, and policies to incentivize sustainable growth and eliminate barriers to sustainable development projects. The manual aids this auditing process, because it breaks apart the standards contained within LEED-ND’s prerequisites and credits and redistributes them into the structure of a typical local plan and code. Communities may use the manual simply to assess existing codes and policies from which changes may flow or to undertake a comprehensive overhaul to create an entirely new land development plan and implementing regulations. Municipalities may also use the manual to identify neighborhoods within a community that are appropriate for sustainable development and apply strategies solely to those target areas through a special area plan, new zoning district, or some other mechanism, such as flexible zoning. The sections of the manual are designed to parallel a typical municipality’s land development plans, regulations, and related policies. It begins by presenting strategies to integrate LEED-ND criteria into local planning policies as expressed in comprehensive plans and special area plans. It then presents strategies for incorporating LEED-ND criteria into traditional zoning code sections, site plan and subdivision regulations, and other land use development standards, including building and related codes. 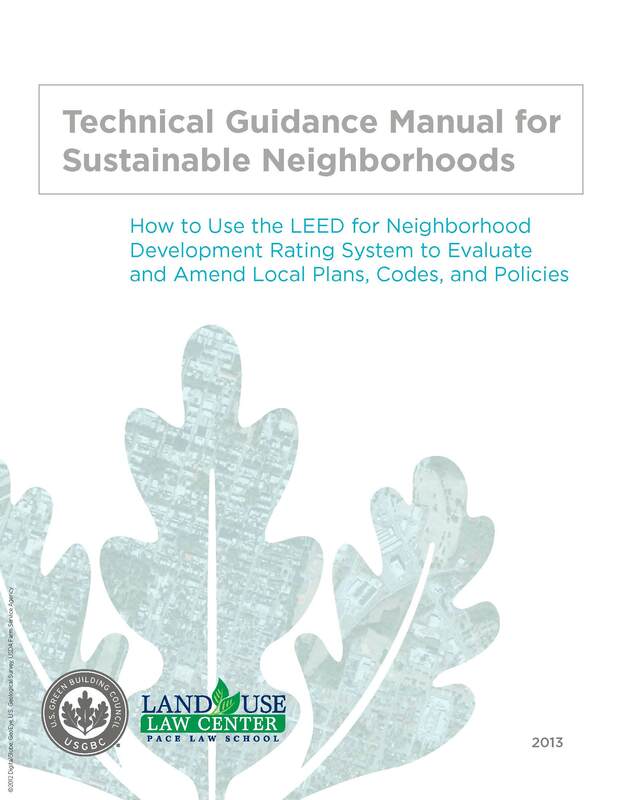 Finally, it introduces strategies for including LEED-ND criteria in non-regulatory initiatives, streamlining the project review and approval process, and providing incentives and assistance for sustainable neighborhood development. Each section references the prerequisites and credits of the 2009 LEED-ND rating system and presents local best practice examples and illustrative case studies. An example illustrates how the manual may be used. A critical component to establishing livable, location-efficient areas is ensuring that development, both residential and commercial, is located within easy walking distances of public transit. To site future development in such sustainable locations, the manual suggests incorporating the following goals and planning actions into a community’s comprehensive plan or special area plans, which will form the basis for later local code amendments. Goals: Encourage redevelopment of existing communities with infrastructure, reduce vehicle trips, increase walking and bicycling, reduce adverse environmental and public health effects, and conserve natural and financial resources. Locate future development within sites served by existing water and wastewater infrastructure or within a legally adopted, publicly owned, planned water and wastewater service area. Sites near many existing neighborhood uses (see LEED-ND Diverse Use Appendix). Prioritize public infrastructure repairs, improvements and enhancements in existing neighborhoods with additional development capacity. By using the list above, a local government can review its comprehensive plan to determine whether it allows or hinders the elements that create sustainable locations. If the comprehensive plan does prohibit such elements, then the local government may amend the comprehensive plan to incorporate these important goals to promote location efficient areas with public transit at their center. Augmenting the manual, the Neighborhood Development Floating Zone is a model ordinance to help local governments foster green community development using the LEED-ND rating system. The Floating Zone is offered as a cost-effective and efficient tool that can be used by local governments hoping to incentivize the private sector to follow green neighborhood development principles when the more extensive zoning update process detailed in the manual is not an option.